what about porque te vas? he sings part of the song as he remembers the lyrics, the words about a boat leaving. curious about the song, i later discover that the song as he sings it is a parody of an internationally popular song with spanish, french, and english language versions. 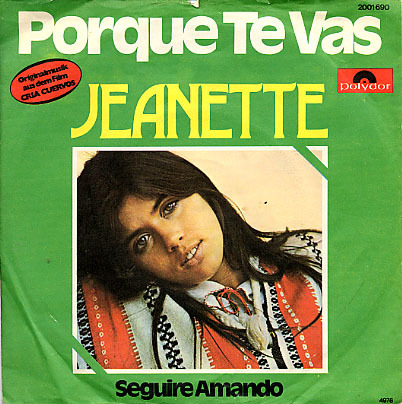 the song was first performed by jeanette, a singer active in spain in the mid-1970s. the song became popular in 1976 because of its appearance in a critically acclaimed film. it is over produced in that plush 1970s way.